There are different kinds of book signings. There are the ones where you go into the bookstore and sign copies of your books that they have in stock. Then there is the author event where you sign books at a table and sometimes give a reading beforehand. 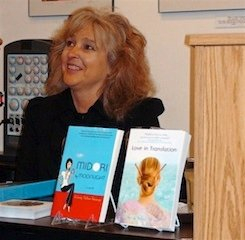 My very first stock signing was in the fall of 2007 at Stacey’s Books, a major independent store in downtown San Francisco where they featured my debut novel, Midori by Moonlight, in a lovely display. I was thrilled and signed each book with the Cross pen my husband had given me to celebrate my first published novel. A couple of hours later I was at my first author event at the huge Borders store in Union Square where I read from my novel, answered questions and signed copies—another major thrill I’ll never forget. Stacey’s closed a few years ago, a victim of Amazon and the big box stores. Borders has just filed for bankruptcy and the Union Square store (one of the largest in California) is on the closure list. Things are changing in the publishing world and more and more people are purchasing their books through Kindles and iPads. Book signings are an endangered species and are set to become extinct—a quaint memory from the past, much like the album signings by your favorite rock star at Tower Records.